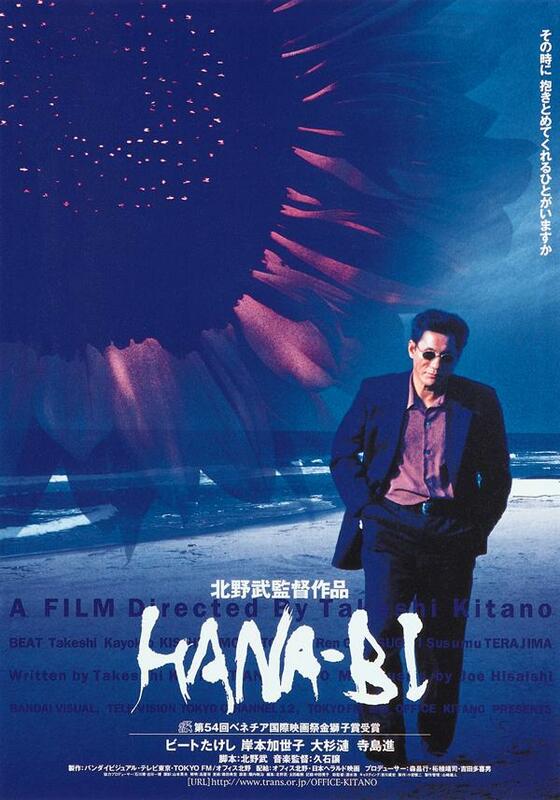 Hana-bi (1997) is Japanese film maker Takeshi Kitano's masterpiece along his Sonatine (1993). Hana-bi reminds me pretty much of his more recent film, Brother (2000), which still has much more humor and positivism in it. Those who have experienced Sonatine may ask can a film be even more beautiful and brilliant, but Hana-bi is at least as masterful, if also different. The film stars again the director himself as Nishi, a police man who learns his wife suffers from some extremely lethal disease which has taken her speech, too. She is going to die soon, and all Nishi has in his mind is to make his wife's last weeks as enjoyable and nice as possible. He is forced to deal with Yakuza in order to get some money for her medical care and other plans he has for her last days, and that leads of course to troubles with the gangsters as Nishi isn't able to pay back his loans. Nishi's partner is another tragic character, who is shot and paralyzed for the rest of his life during one shoot out. Also one of Nishi's partners is shot dead in a scene, which belongs to the film's most powerful scenes and it is shown as a flashback, in the usual silent and symbolic style of the director. What follows is all the great elements we've learned to wait from this artist from one of the greatest cinema lands in the world, Japan. Hana-bi is almost unbearably sad and emotional, and its most tragic character is Horibe, the partner who is paralyzed and totally abandoned by his wife and children after he loses his ability to move and be like his used to. The scenes in which Horibe tells to Nishi about his loneliness and that everyone has left him are extremely powerful and really make think about the values of one's own life for the second time. Horibe finds some kind of way to express his sadness through art and painting, and he gets a great gift from Nishi, one of his last friends who understands him and would never leave him like the others did. The shoot out flashback is also one memorable segment in this film, and it is in its slow motion one of the most beautiful, yet shocking depictions of violence ever possible. Hana-bi has some very strong scenes of violence, and it all erupts again as rapidly as always in Takeshi's films. Weak souls resort to violence very often, and the result is always just more violence, death, depravity and pain, both physical and emotional. I will stress again that those who think Takeshi's cinema is gratuitously violent (or Japanese cinema in general, i.e. the work of Takashi Miike and Ishii) miss the whole point as his films absolutely never glorify violence or present it as a noteworthy tool, his films analyze violence and show many aspects of it, without hiding or embellishing anything. His films are as important in this level as they are in cinematic element level as some of his usual trademarks are absolutely unique and stunning, and Hana-bi is definitely not an exception. The music is again by Joe Hisaishi, who composed Takeshi's films Sonatine and Brother plus some others. The soundtrack in Hana-bi is again one key element of the film, and it is perhaps closer to Brother's than Sonatine's, but still all these three films have unique and masterful soundtrack which is full of emotions. The greatest element of all, however, in Hana-bi are the paintings by the director himself, who painted them after his nearly fatal motorcycle accident in 1994. They are stunningly beautiful and staggering as they combine different types of nature's beauty in very unique way. The animals combined with flowers are so wonderfully effective and their power is taken even further by the music. This symbolism creates so powerful experience that it almost requires the viewer to cry for the characters, but also for the cinematic magic this director has created. The usual wry humor of Takeshi is almost completely missing in Hana-bi, but there are some little bits, which are still in right places and work as fine as they always do. Still, this is the most inconsolable film of Takeshi, and be sure to watch the whole film the end credits included, since there's one extremely purifying image coming, in the tradition of the finale in Brother. Despite Hana-bi being so sad and harrowing, the very end is again very relieving and belongs among the greatest endings of all time. Another film with similar ultra-powerful image at the end is Lars von Trier's Breaking the Waves, another masterpiece from the 90's. I just cannot imagine loving some other film maker's work more than Takeshi's, and he is among the greatest cinematic artist I know, and it is not a surprise he's from Japan, since Asian film makers are usually the most personal and stunning and don't have any restrictions for their work like in Hollywood film makers usually have as they have to keep the ratings and commercial things in mind. Fortunately Takeshi has been able to do his films completely free, and I really hope he can continue it for many years to come. Hana-bi is his brightest masterpiece. 10/10 immortal cinema.